Collection of Rolland DeRemer, 12-23-03 George W. Beatty was born at Stevensburg, N.J. August 28, 1887. He graduated from High School in 1904 and then started to work in the printing business, later becoming a linotype operator in New York. 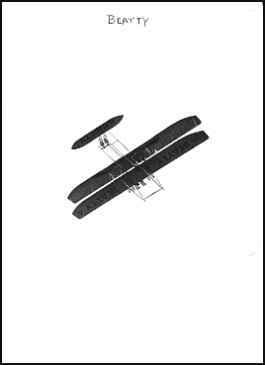 There he became interested in a gliding club and in 1909-1910 assisted in the construction of a homemade Santos Dumont Demoiselle using a 3 cyl. Anzani engine. 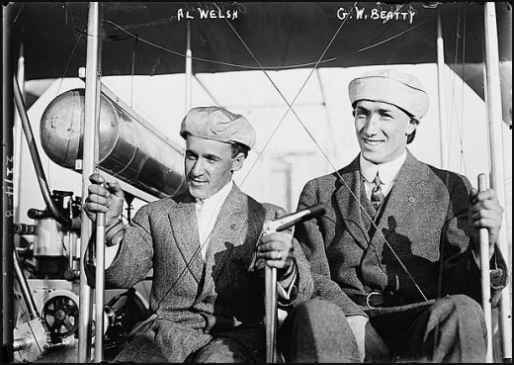 Flight attempts were not successful and the project was abandoned, nevertheless Beatty became seriously interested in aviation as a result of this experience. After seeing the flying at various New York air fields and meets in 1910 the flying bug really bit him and he entered the Wright School at Nassau Boulevard, L.I. in the spring of 1911, and was taught to fly by Wright instructor Al Welsh. He started his instruction on June 24th and soloed July 23rd, 1911, and that same day flew as a passenger with Welsh to establish a new American 2-man altitude record of 1,860 feet. 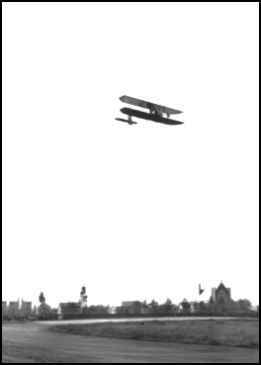 Then on August 5th Beatty broke that record, flying to 3,080 feet with Dr. Percy Reynolds as passenger, also winning a cup given by the Farman Co. for duration on the same flight. August 6th he flew for his license, No. 41, and also flew with a passenger from Nassau Boulevard to Long Beach, L.I. and return, using the Wright plane owned by Walter B. Davis. Following this, he entered the famed Chicago Meet at Grant Park August 12th through 20th. 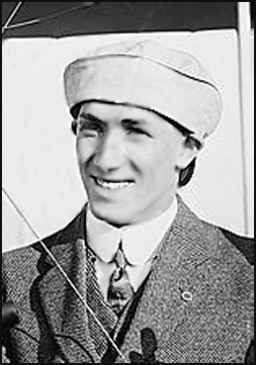 There, on the first day, Beatty established a new American 2-man endurance record when he flew for 2 hours, 4 minutes. On August 13th he set up a new world's 3-man record of 1 hour, 18 minutes, and on August 19th broke his own 2-man record when he flew for 3 hours, 19 minutes, carrying Fred Wagner, a Chicago Tribune News photographer. 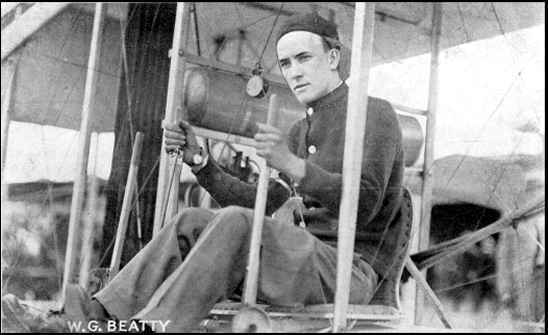 Beatty was one of the bright stars of the Meet flying a total of 24 hours, 21 minutes during the event to win second place for total duration, exceeded only by Cal Rodgers. 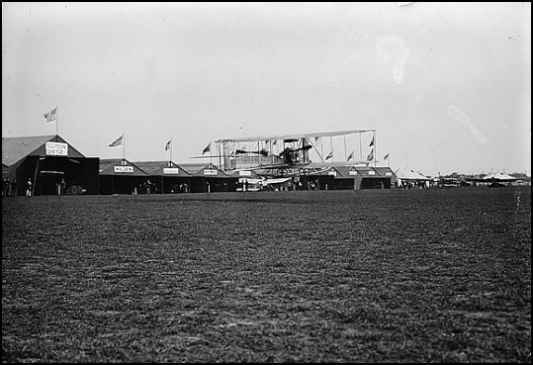 Boston Meet - 1911 From Chicago, Beatty entered the Boston Meet where he flew from August 26th to September 6th, then entered the meet at Brighton Beach, L.I. September 8-10th. He then flew at the Nassau Boulevard meet September 23rd through the 39th and again made a very creditable showing. Following this he went to St. Louis, Mo. and flew in a meet held at Kinloch Field starting October 14th and continuing through several days. 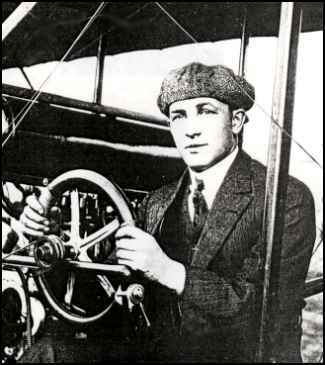 There he carried many notable passengers, including E. Percy Noel, Editor of AERO Magazine. Beatty continued his flying at Kinloch through October into November, doing school and passenger work. He left St. Louis December 4th for Dayton to get a new plane at the Wright factory. This was shipped to Buffalo, N.Y. where he had a new FRONTIER 60 H.P. 8-cyl Vee engine installed, then made several test flights on December 21st and 22nd, following which it was shipped to Nassau Boulevard for school and passenger work. Nassau Bloulevard - 1912 January 1, 2 and 3, 1912 he was again flying at Nassau Boulevard, carrying passengers and starting his school activities. 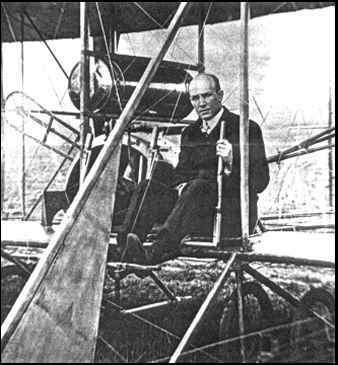 On January 20th he established a record there by flying for 10 minutes carrying three passengers. Later that day he made an extended flight over Queens, Jamaica, Hyde Park and back to Nassau. February 13th Beatty flew over New York City and landed in Central Park, to become the FIRST person to land on Manhattan. Return to Nassau was made the next morning. By March 1st he had a large class of pupils and by mid-April had completed the training of sixteen students and was also busy with passenger work. March 28th he made another record by flying for 12 minutes carrying four pasengers. Beatty remained very active with his school throughout the spring and early summer months, under the management of A. Leo Stevens for exhibition engagements and passenger bookings. About July 1st he took delivery of another new Wright plane, and on July 10th moved his school from Nassau Boulevard to Mineola, L. I. 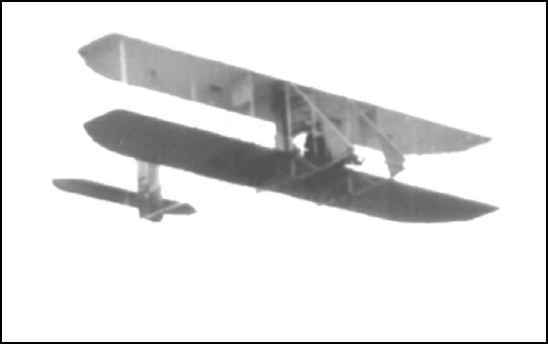 Late in July he went to College Park, Maryland for the Wright Company to complete the tests of Government planes there, left unfinished due to the fatal accident of Al Welsh. My mid-August he was back at his school at Mineola. October 12th Beatty flew at a Columbus Day Air Meet at Oakwood Heights, Staten Island and was there again on November 5th. After finishing the fall season on Long Island he went south for the winter. 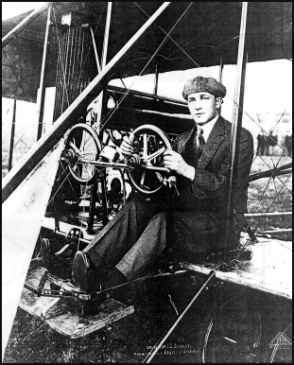 College Park, Maryland - 1912 While Beatty was flying at College Park, Maryland for the Wright Company in July, 1912 he became interested in the Gyro rotary engine development there, and as a result had a 7 cyl. 50 H.P. 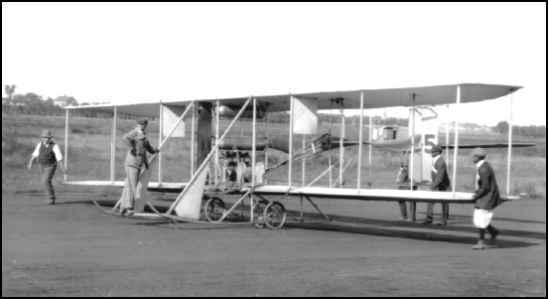 model installed in one of his Wright planes in April, 1913. Following initial tests at College Park Beatty began carrying passengers in this plane. This engine was considerable lighter that the original Wright model and, having more power, gave the Beatty-Wright phenomenal performance, so he was delighted with the installation. On May 6th he flew over Washinton, circling the Capitol, the Washington Monument and down Pennsylvania Avenue. He remained at College Park through May and June carrying passengers and doing some training. In July Beatty shipped his Gyro-Wright to England in the interests of the Gyro Motor Company to demonstrate the engine there. He started flying on August 2nd at Hendon Air Field outside of London, where he remained until the fall season. In November he again flew with three adult passengers which drew much attentioin. While in England he saw the opportunity for a good training business and started negotiations for a flying school. That fall Beatty returned to the United States for the winter, but went back to England in February, 1914 where he merged with the well known Handley-Page Co. to open a large flying school at Hendon. He furnished three American Wright machines to add to the Handley-Page equipment and also had the assistance of their previous school instructors. The school prospered and did a flourishing business. World War I was approaching and flight training was much in demand. In 1915 the Beatty School had five assistant insturctors and a large continually graduating class of students. 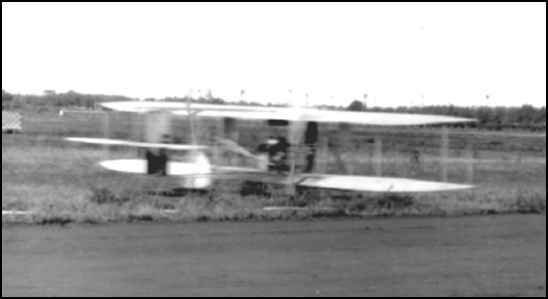 Dual control Beatty Gyro-Wright and Caudron-type tractor biplanes were used. For advanced instruction they also had some special small single-seater tractor biplanes with Gnome engines. During 1915 Beatty also started an aeroplane parts business at Hendon which prospered through World War I, making wing and tail assemblies and various sub-contract work. By 1916 the Beatty Flying School was probably the most popular one in England and going strong. That year he saw the need for a good reliable training engine, so designed and built one which was announced in January, 1917. It was a rugged 4 cyl. 60 H.P. liquid cooled engine, weighing 225 pounds complete. It is not known to what extent this engine was used in his school planes, nor how long he continued work on the project. After World War I the training business slumped and Beatty worked for the British Government for a time in closing out war contracts. In the summer of 1919 he flew exhibitions in several countries on the Continent. He remained in Europe until 1921 then returned to the United States for a visit. Following this Beatty gave up flying, returned to Europe and went into the motorcycle engine business. He soon gained prominence in this field, and in 1923 designed and built a special racing motorcycle which won the Tour de France that year. He remained in the motorcycle business there until the business depression of 1929 forced him out of the field. Returning to the United States Beatty did not find a permanent position until 1934 when he returned to the printing business with the Hughes Printing Company of East Stroudsburg, Pennsylvania. He advanced rapidly to Superintendant with this firm and remained there until he passed away very unexpectedly on February 20, 1955, at age 67. He was survived by his wife, and was buried in Laurelwood Cemetery in Stroudsburg. Early Bird and flying pioneer, George W. Beatty contributed a major share to early American aviation history and richly deserves great credit for his many flying accomplishments. A very active pilot during the early days of aviation, he was best known for his duration and weight carrying flights, and was undoubtedly one of the best known and most capable instructors of that time. A very skillful and careful pilot, he had few accidents and taught countless numbers of fledglings to fly, both here and abroad. His name and the extent of his work will long remain in the annals of aviation history. Ellyson Dietz, Walden, Northwood, and Clarke. at the Brighton Beach Track in New York. George Beatty landing his Wright Model B biplane at the 1911 Brighton Beach Air Meet during September 8th to 10th. Before World War I, air meets were very popular in the United States of America and many famous aviators would attend them with their airplanes. Some of the other aviators that attended this air meet were Harry Atwood, Tom Sopwith, the English aviator Claude Grahame-White, and Eugene Ely, who was the first pilot to fly and land airplanes from the deck of a ship, which he did, earlier, in 1911. Transcribed by Bob Davis - 8-12-04 New York, May 4. -An accident to the motor of his machine halted the flight of Marshall E. Reid, who started from Hempstead, L.I., this noon, intending to fly to Philadelphia. Near Elizabeth, N.J., during an attempt to descend, the biplane fell and Reid and his passenger, George W. Beatty, were spilled. The machine was wrecked, but neither man was hurt. ONLINE RESOURCES If you search for "George Beatty +aviation", using the Google search engine, (7-13-04), you will find about 29 links. Perhaps the most helpful is the following. 1911 BRIGHTON BEACH AIR MEET This page on Roy Nagl's website offers many fine photographs and a very comprehensive account of the Air Meet. It includes many references to George Beatty, as well as to many of his contemporaries such as Eugene Ely, Claude Graham-White, Harry Atwood, Henry Walden, and Thomas Sopwith. It is divided into three sections, The Air Meet, The Air Meet Program, and Newspaper Articles about the Air Meet.. You can access the page by clicking on the title above. GEORGE BEATTY BIOGRAPHY NOTE This page on the National Air and Space Museum website offers a nice summary of his life and career. The following excerpt introduces his story. "Born in 1887 or 1888 in Whitehouse, New Jersey, George W. Beatty was employed as a young man as a linotype operator. He was shortly to enter the field that would define much of his life. In June of 1911 he enrolled at the Wright School at Nassau to be taught by Al Welsh. Soloing on July 23 of that year, he set a new two-man American altitude record on the same day. Throughout that summer, Beatty would set several more records, in altitude, weight-carrying and duration. On August 6, 1911, Beatty obtained license number 41 and subsequently attended meets where he was to break several American and world records. Also in that year, he would become the first to fly a plane in which air to ground communication was maintained throughout the flight." To read the rest of this story on the website of the just click on the title above. There are two entries for George on the AEROFILES website. and using the "Find" function on "Beatty"
using the "Find" function on "Beatty"
FAIRGROUND & KINLOCH, 1911 Encouraged by the success of its previous ventures, particularly those of 1910, the Aero Club of St. Louis decided to stage two air meets in 1911. 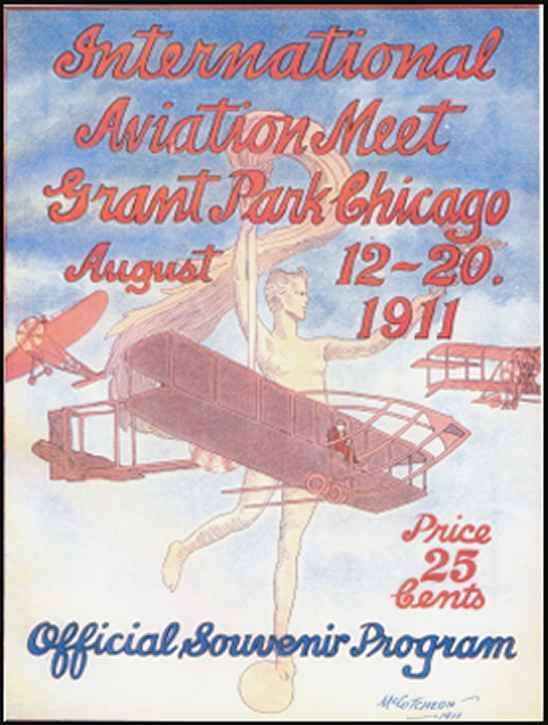 Although the city's aviation fame came from free ballooning, both tournaments would concentrate on heavier-than-air craft, in keeping with the latest developments in aviation. The star of the meet was to be Walter Brookins. A number of other aviators were scheduled to appear at the Fairgrounds; Andrew Drew and Tom Benoist of St. Louis, John D. Cooper, Charles Zornes, Sax Ganz, C.O. Prowse, and Hillery Beachey, the brother of Toledo aeronaut who had flown dirigibles in St. Louis in 1907 and 1909. In addition, several pupils from Tom Benoist's flying school intended to exhibit their fledgling talents; Harry Rafferty, John Woodlief, Alfred Boullet, B.N. Elsk, and Charles Griffin. Contests for rapid starting, speed, altitude, target bombing, and accurate landing were planned, as well as the usual aerobatics by all participants. The Aero Club of St. Louis scheduled a broader tournament for October 14-21 at Kinloch Park, its permanent aviation field. On September 5, 1911, Albert Bond Lambert signed an agreement with A. Roy Knabenshue, manager of the Wright Company, whereby the Wrights would supply three pilots and biplanes in return for 25 perecent of the gross receipts of the meet. The three aviators -- Howard Gill, J. Clifford Turpin, and P.O. Parmelee -- were to fly every day but October 15, because of the rule of the Wright Company against Sunday flights. Also entered were Dr. Henry Walden of Mineola, Long Island, with his picturesque Antoinette monoplane; Amedee V. Rayburn Jr. of St. Louis with his Bleriot monoplane; Horace Kearney and John D. Cooper of St. Louis with Wright biplanes; George Beatty; and Walter Brookins.